We are now accepting bookings for Summer 2019. We thank our new and returning summer guests for a fully-booked 2018 season. 'Quitan' is available only for Saturday to Saturday rentals, in weekly increments, for a maximum of six guests to be named on the rental contract . Parties and events of any type or size including additional persons are not permitted without prior permission by the owners. “Quitan” is a waterfront private home located on a four-acre compound with direct frontage and a private dock on Ninigret Pond. 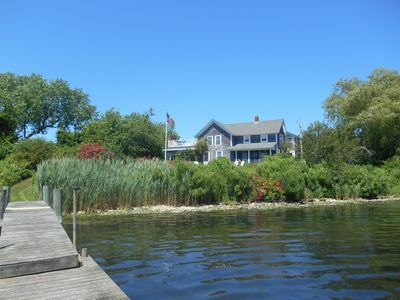 Built in 1874, this house was the original Nye farmhouse for the property that now encompasses the Tockwotten Cove and Pond Shore summer communities. 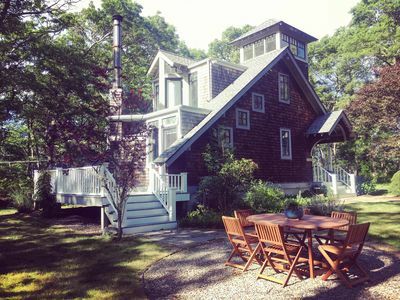 The house has remained in the same family for the past hundred years and is offered selectively for short-term summer rental. 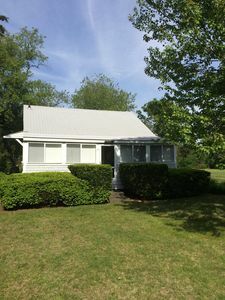 The first floor of the house consists of a large living room, formal dining room, kitchen with waterfront deck, sunroom with a fireplace, screened porch and half-bath with washer and dryer. 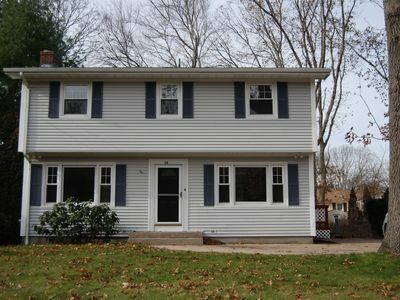 On the second floor are three bedrooms and two full baths. The master bedroom has the bath en-suite as well as a large, private sundeck. 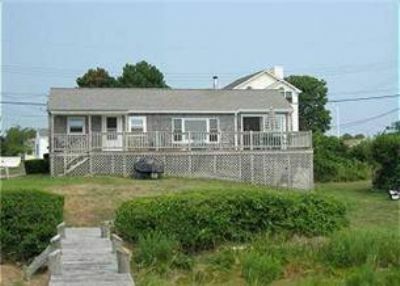 All rooms have unobstructed views of Ninigret Pond, the barrier beach and the Atlantic Ocean with Block Island beyond. 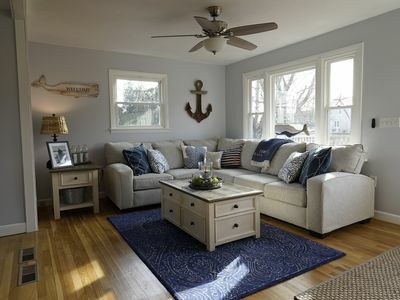 Because the house has been maintained by one family as its summer residence for many years, its charm, amenities and decoration are much more than a step above the typical summer rental. The home is furnished in an eclectic and comfortable style with a combination of antiques, wicker, art and artifacts that will delight and interest you. 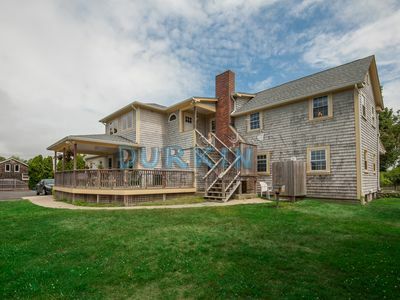 While all modern amenities are provided, this special house maintains the feel of simple, gracious living that characterized the summer colonies of an earlier time. The grounds of Quitan include extensive perennial gardens, roses and flowering shrubs surrounding the house and the broad, well-maintained lawns. 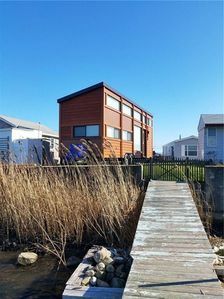 Your private dock provides easy access to Ninigret Pond, East Beach and the Breachway where water-based activities such as clamming, fishing, swimming and water skiing abound. 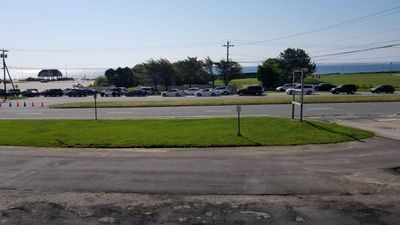 A pass for unlimited beach access and free parking is also provided with the rental. 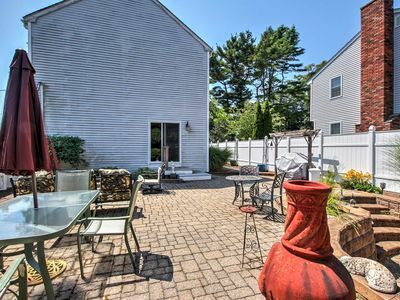 The convenient location of the house and of Charlestown provides easy access to the area’s many fine restaurants, Newport attractions, Block Island, Mystic Seaport and the Foxwood and Mohegan Sun casinos. At Quitan, we allow a maximum of six overnight guests including children. All overnight members of the rental party must be named in the rental agreement. Parties and pets are not allowed on the premises and smoking is allowed only outdoors. You will be greeted by the owner on your day of arrival. We will give you the keys and beach pass and after orientating you to the property and answering any questions you might have, we will leave you to enjoy your private family vacation. We are readily available throughout your stay to provide whatever assistance you may require. 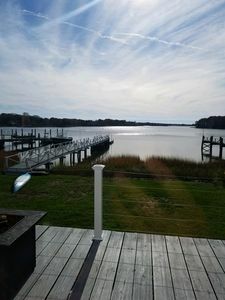 We have a greater vested interest than a 9 to 5 management company handling many properties and are committed to providing you with a superior vacation experience. 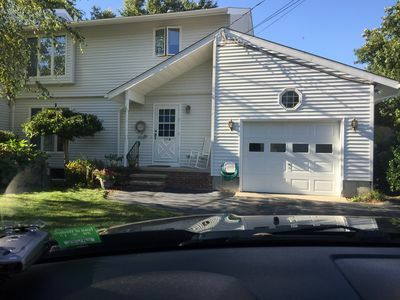 The house has been professionally cleaned prior to your arrival and should be left in as-found condition with the exception of vacuuming, dusting and thorough cleaning of kitchen and bath. All trash should be put out by you for Saturday morning pick-up, the dishwasher should be run and emptied, all items should be returned to their original location and all of your personal effects removed. A cleaning fee of $125 is added to each rental and is due with your final payment. 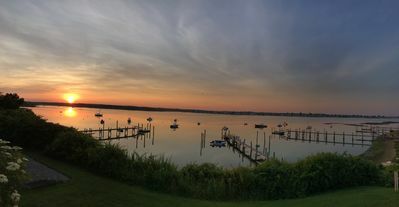 A Rhode Island Sales and Use Tax of 7% and Short-term Dwelling Rental Tax of 1% (total of 8% tax) on the basic rental amount and cleaning fee (tax is not applied to damage deposit) is collected in accordance with state law. The cleaning fee, tax and refundable damage deposit of $500 are due with the final payment. We will notify Homeaway/VRBO to return your deposit within two days of your departure provided there are no damages whose cost to repair cannot be ascertained. It is our objective and standard practice to return your deposit promptly and in full. Per local custom, guests provide their own bed linens and towels. The master bedroom has a queen-sized bed. The second bedroom has a pair of twin beds and the third bedroom has a double bed. Blankets, pillows and all household items necessary for a comfortable stay are provided. 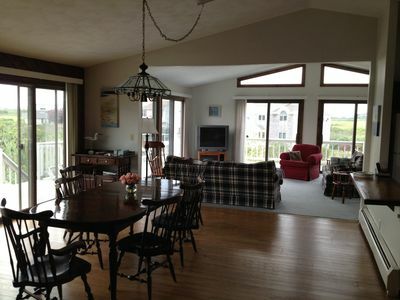 * Wireless Internet, Cable TV, Unlimited local and long-distance calls within US. 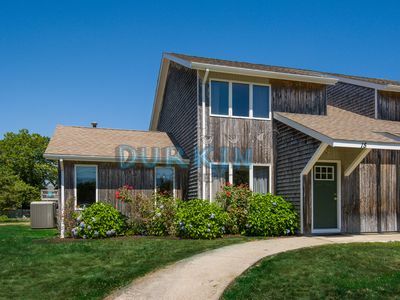 Summer Rental at Sand Hill Cove in Narragansett, R. I. 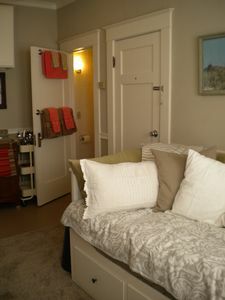 Cozy Functional Private Room and Shower; Walk Into Town; Minutes To Beaches. This condo is newly refurnished and tastefully decorated. Sleeps 4 - 6 comfortably. 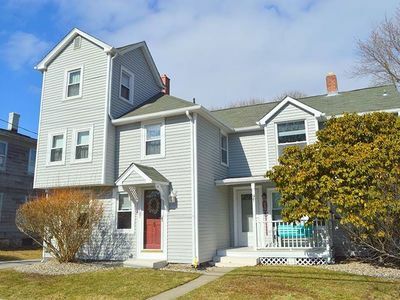 Wakefield House - Steps from Marina & Main Street! 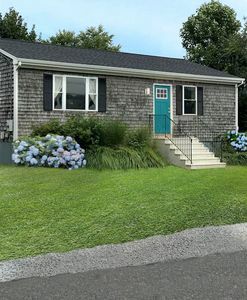 Charming cottage near "Everything Narragansett" School year rental also avail. 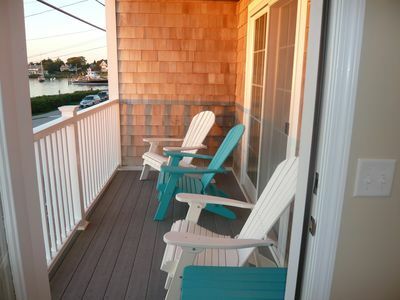 Second floor beach house - 1 block to Atlantic Ocean beaches! 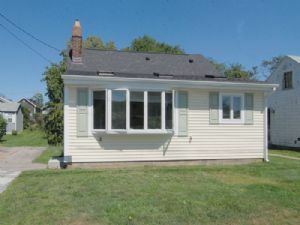 Newly Renovated Cottage In Quaint Village of Snug Harbor! 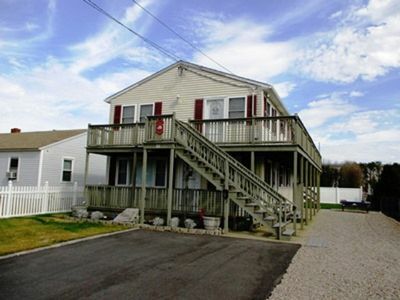 Narragansett - Waterfront 2 bedroom home on Great Island with 3 season room. Nice pond views!